I just cast on for my LBT, and so far, so good. When I received my Summer '06 IK, I knew I wanted to make this project. However, it wasn't until I stopped into my (not so) LYS that I decided to make it sooner rather than later. The shop owner was wearing the LBT knit up in the SWTC "Parrot" variegated colorway, and it was BEAUTIFUL!! The drape on that yarn was perfect. Unfortunately, she did not have any solid colors left, and I'm not a variegated kind of gal. I almost bought the yarn anyway because it looked so perfect knitted up. Instead of the SWTC Bamboo, I'm using the pima cotton/silk blend from Frog Tree. It is very lightweight and has a nice hand so far. 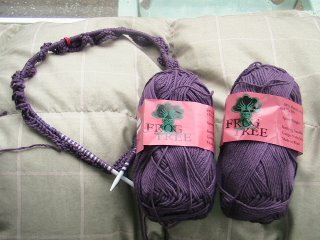 I can't wait to see how the tank progresses in this yarn. I'll keep you all posted.